My work explores intimacy in ways that provoke questions about our emotional selves and the vulnerabilities, fears, and longings that shape the stories we tell. I mix media and techniques that include building assemblages with found objects, projecting film and video, integrating text such as prose and poetry, and creating distinctive environments with light. By using a variety of mediums and methods, both everyday and unconventional, I create opportunities for meditation on what is hard to grasp, whether it is a deep inward feeling or a moment of uncertainty, and to further investigate our relationship to the ever-changing landscape around us. I approach my work phenomenologically, retrieving fragments of images culled from memory to piece together meaning, and use discarded tools that lends to my work palpable stories of impermanence and fragility. I’m often confronted with the limitations of language in expressing life’s obscurities, so I set forth to create a new language that allows materials to speak in their most raw and uninhibited forms. In 2018, my work was shown in a two-person exhibition at MITU580 (Brooklyn, NY), as well as in group shows at Pratt Institute - Steuben Gallery (Brooklyn, NY) and Ed. Varie (New York, NY). 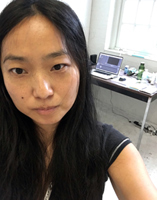 In 2017, my collaborative multimedia project with musician and composer, JunYi Chow, received the Queens Council on the Arts - New Work Grant and was presented at Flushing Town Hall (Flushing, NY) and the Jamaica Center for Arts and Learning (Jamaica, NY). In addition, my work has been exhibited at the Queens Museum (Flushing, NY), NURTUREart Gallery (Brooklyn, NY), Horton Gallery (New York, NY), AC Institute (New York, NY), Vox Populi (Philadelphia, PA), Roman Susan (Chicago, IL), Rochester Contemporary Art Center (Rochester, NY), amongst others. I was Artist-in-Residence at The Studios at MASS MoCA Residency Program (North Adams, MA) and participated in The Art of Stillness Residency at the Banff Centre for Arts and Creativity (Alberta, Canada). I received an MA in Media Studies from the New School and a BA in Journalism from New York University.